Connecting the Dots » WHO’S TO BLAME FOR HIGH-STAKES-TEST CHEATING SCANDALS? WHO’S TO BLAME FOR HIGH-STAKES-TEST CHEATING SCANDALS? 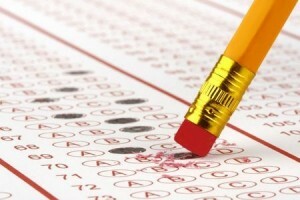 What could the Veterans Affairs scandal and the Atlanta public school test cheating scandal have in common? Quite a bit, actually. Both involve public employees whose jobs committed them to help vulnerable people, could not fulfill those commitments, and tried to cover it up. In my last Connecting the Dots post, Want to Get to the Root of the VA Scandal? Follow the Money, I suggested that responsibility in the VA debacle belonged not only to the VA functionaries who jiggered appointment records to make it look like veterans were receiving timely attention, but should be shared by those who took the country to war without budgeting adequately “to care for him who shall have borne the battle” (in the words of Lincoln that form the VA’s motto) and those who thought that management systems, goals and incentives could compensate for actual funding for veterans’ health care..
As a recent and riveting New Yorker article, “Wrong Answer,” recounts, the events that led to the Atlanta testing scandal followed a similar pattern, a pattern of cheating that arose from an effort to meet unrealistic goals, driven by a combination of dedication and the desire to keep jobs and earn bonuses. The scandal has been heavily covered in the Atlanta Journal-Constitution and national media: Public school teachers and administrators previewed sealed tests and changed wrong answers to correct ones. 109 school system employees implicated, including 38 principals and administrators. And a former superintendent, mortally ill with cancer, and her associates await trial as the masterminds of the enterprise. [After a year,] the cheating process began to take the form of a routine…[The school’s reading coordinator] paged up to six teachers and told them to report to the room. While their students were at recess, the teachers erased wrong answers and filled in the right ones. Lewis took photographs of the office with his cell phone so that he could make sure he left every object, even the pencils on Kiel’s desk, exactly as he’d found them…. cheating had become a “well-oiled machine”. The Atlanta scandal raises a far more complicated set of issues than the VA scandal, many of whose problems could be solved with the money needed to hire more doctors and other staff needed to treat sick and injured vets. Unlike VA employees, who gamed the system to keep their jobs and earn bonuses, the Atlanta teachers in “Wrong Answer” did what they did in what they thought were the best interests of their students as well as themselves. Many children, predominantly from low-income families, are at levels of education far below grade level and need to catch up. Setting goals is a useful way to set expectations and determine whether they’ve been met. Even “stretch” or aspirational goals have their place: mediocre or worse sports teams begin each season and game believing that they can win, even in the face of rosters that suggest that victory is unlikely. But just as the trouble at the VA started when treating patients was replaced as an objective by meeting—or appearing to meet–time-to-appointment goals, so the trouble in Atlanta started when education was replaced as a goal by meeting test-score targets. “’Data’ and ‘accountability’ had become almost magic words,” Aviv writes: “If administrators repeated them enough, it seemed they believed that scores should rise, even if there hadn’t been significant enhancements in instruction. It’s not an uncommon phenomenon, Aviv was told by John Ewing, the former executive director of the American Mathematical Society. Ewing is perplexed by educators’ ”infatuation with data,” Aviv writes, “their faith that it is more authoritative than using their own judgment. He explains the problem in terms of Campbell’s law, a principle that describes the risks of using a single indicator to measure complex social phenomena: the greater the value placed on a quantitative measure, like test scores, the more likely it is that the people using it and the process it measures will be corrupted. Like the VA malefactors, the Atlanta teachers who leaked test questions and changed answers (a small fraction of all Atlanta teachers) had choices. They made the wrong ones and will suffer the consequences. But they weren’t the ones that set unrealistically high expectations–67 percent of its students had to score satisfactorily in language arts and 58 percent in math or the school could be closed–for children who were still sounding out words in seventh grade. And they weren’t the ones who, by labeling their policy “no excuses,” implied that references to the burden of under-education that students brought with them were “excuses” made by lazy or incompetent teachers. Under-educated students can be brought up to grade level. The KIPP charter schools have had some success doing it: not by establishing unrealistic ‘no-excuses” goals, but with significantly longer school days, weeks and years and with teachers who give their students their cell-phone numbers for evening and weekend consultation; and not in a year, but over several years. The point is that bringing under-educated students to grade-level and beyond takes years of smart and hard—perhaps unsustainably hard—work. It will not be accomplished by setting goals and blaming teachers if their students fall short. And if—when—administrators nevertheless set such goals and sanction teachers and schools when the goals are not met, those who set the goals should join the teachers in taking the fall. DID YOU HEAR THE ONE ABOUT PRESIDENT TRUMP? HAVEN’T WE SEEN THIS BEFORE? WHICH HISTORY WILL IT REPEAT? WHO’S AFRAID OF DONALD TRUMP? WANT TO CLOSE THE RICH-POOR COLLEGE-COMPLETION GAP? WANT TO GET TO THE ROOT OF THE VA SCANDAL? WHAT DOES IT COST? WHO SHOULD PAY? NOW WHAT WERE YOU SAYING ABOUT INTERVENING IN SYRIA? We now know why the Obama Justice Department is so exercised about the leak of intelligence about North Korea’s nuclear intentions. BUT WAS IT THE RIGHT BOOK? DO WE NEED TO OUR PRESIDENTIAL CANDIDATES? WHO’S RESPONSIBLE FOR GOVERNMENT STALEMATE? Blame It on the Founding Fathers. And who was the American convicted of being Tokyo Rose? What was in the health care bill that passed Congress? On October 7, the war in Afghanistan turns eight. I wasn’t a Kennedy fan originally, not a fan, I mean, of the liege lords of Camelot, John and Robert Kennedy. MOTHER OF MERCY, IS THIS THE END OF MARION BARRY? HOW CAN YOU TELL IF OBAMA’S ENDING PARTISAN GRIDLOCK? Q: COULD WE IMPROVE THE HEALTH CARE SYSTEM BY MAKING IT MORE LIKE THE AUTO INDUSTRY?A: NO. WILL FAMILIAR NAMES, FAMILIAR FACES BRING NEW IDEAS IN HIGH PLACES? WHO CAN SAVE THE AUTO INDUSTRY? Using the fTiny theme design by Fredrik Fahlstad Proudly powered by WordPress.